Title: LEXIPHANES, a Dialogue. Imitated from Lucian, and suited to the present Times. Being an Attempt to restore the English Tongue to its ancient Purity, and to correct, as well as expose, the affected Style .. of many late Writers, and particularly of Our English Lexiphanes, The Rambler [Samuel JOHNSON]. 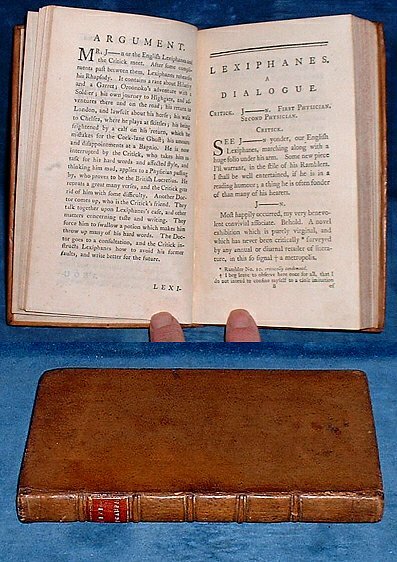 Description: London, J. Knox second edition same year as first 1767 . 175x100mm contemporary calf on 5 raised bands gilt ruled with red spine label (tips rubbed) xxxix + +185pp +pp publisher's catalogue. *Amusing satire on Samuel Johnson. Boswell says: "This year  was published a ridicule of his style, under the title of Lexiphanes. Sir John Hawkins ascribes it to Dr. Kenrick; but its author was one Campbell, a Scotch purser in the navy. The ridicule consisted of applying Johnson's 'words of large meaning' to insignificant matters, as if one should put the armor of Goliath upon a dwarf .. This malicious drollery .. could do no harm to its illustrious object." A lovely clean crisp copy.